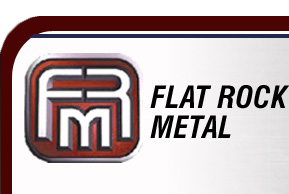 Flat Rock Metal, Inc. ("FRM") is pleased to announce it has been awarded United States Patent No. : 7,895,928,B2 and Canadian Patent No. : 2,638,328 for its Angle Shear Device. This invention relates to a shear device and more particilarly relates to a shear device that is adjustable so as to shear a work piece into any desirable configuration. Metal shears are well known devices for cutting sheet metal. Metal shears can range anywhere from small hand held devices to large fixed platforms weighing several tons. Metal shears may have a fixed cutting head (wherein the position of the cutting head is fixed relative to the infeed of material). Metal shears are also available with pivoting heads wherein the angle of the shear cutting head can be adjusted relative to the infeed of the material. Although pivoting shears are well known in the art, they suffer from a number of drawbacks. For example, although pivoting shears offer the flexibility of varying the angle of the shear cut, the fact that the shear head is movable makes it more difficult to hold certian dimensional tolerances on the sheet metal being processed by the shear. Additionally, pivoting the shear head introduces certain complications to the design of the mechanisims used to deliver the sheet material to the shear and the mechanisms used to remove the sheet material from the shear (after the material has been sheared). Moreover, shears that are used in an automatic setting (where the sheet material is automatically fed to the shear and removed from the shear) must be able to position the sheet metal very accurately in order to achieve consistency amongst the sheet metal blanks produced by the shear. Click Here for a PDF Information Sheet Regarding our Angle Shear Process.